The Obama years have been a good time for those involved in energy research and development, particularly clean energy and climate change research. In 2009, stimulus funds boosted energy R&D spending to levels not seen since the early 1990s. Since then, even with the federal sequester and a hostile Congress, energy R&D funding levels have stayed at almost double what they were in the Bush era — although bear in mind those funding levels remain well below what experts recommend to support the technological advances needed to stave off the worst of climate change. Now, the election of Donald Trump has raised questions about the future of that funding. Trump does not accept the science consensus on climate change, and has previously called it a “Chinese hoax.” Prominent climate scientists whose work is funded in whole or in part by the federal government have publicly expressed fear that their projects will be defunded. Meanwhile, in coal country, many are hopeful that the Trump administration will focus its attention on them. “Maybe shifting some of those resources away from the renewable industry, which has been a tremendous beneficiary of federal assistance under the Obama administration, and directing some of that towards developing technology to help us use our coal resource better,” said Travis Deti, executive director of the Wyoming Mining Association. What is Trump likely to do? And what kind of impact could it have? To start, let’s look at how much money actually goes into energy research and development. Energy is that tiny orange sliver — 2 percent of the total pie of R&D funding on average between 2000 and 2017, or an average of $2.2 billion a year. 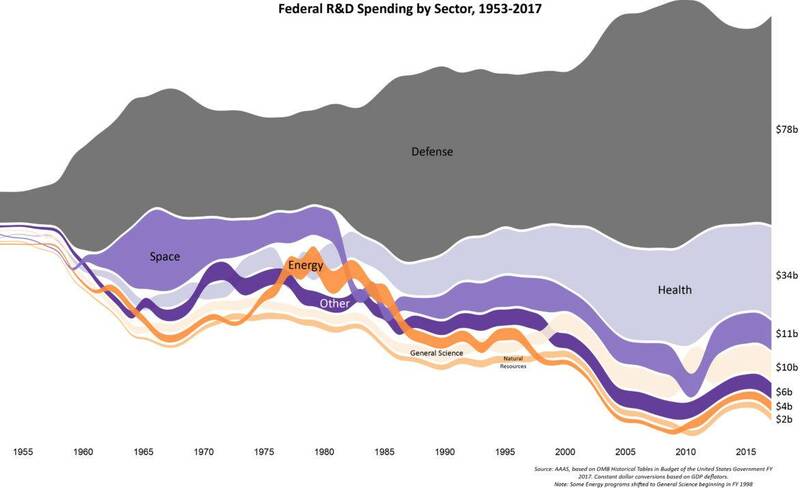 Compare that to defense R&D, which averaged $78 billion a year over the same time period, or 56% of all R&D spending. Or, to look at it from a slightly different angle, of all of the subsidies that flow to the energy sector, only a tiny fraction go to research and development. Instead, most government help for the energy sector comes in the form of tax breaks or other direct subsidies. Whereas R&D is meant to develop brand new technology, most subsidies are designed to help developed, but not yet commercially viable, technology gain a foothold. Where do the energy R&D dollars go? So, there isn’t a lot of money that flows to energy research, but of the money that does, where does it go? Funding levels fluctuate significantly year-to-year, but let’s look at 2013, for an example. The biggest single beneficiary from federal R&D dollars in 2013 was nuclear, followed by ‘other renewables,’ which includes things like batteries, ocean energy and energy storage. Obviously renewables as a collective received a lion’s share of the funding, but those who feel coal has been shortchanged under the Obama administration might be surprised to see that at least when it comes to R&D, coal is actually quite a large beneficiary, receiving considerably more funding in 2013 than wind, although less than solar. That trend held true in 2010 as well, when solar and coal R&D spending were roughly the same. Energy research and development is not an area Donald Trump has spoken about in detail, and given his policy swings on much more prominent issues, it would be unwise to read too much into the policy tea leaves. However, presidents do have considerable sway when it comes to directing federal research priorities. George W Bush steered nearly $1.2 billion toward researching the so-called “Freedom Car,” a hydrogen fuel cell car. He announced the initiative in his 2003 State of the Union, saying “the first car driven by a child born today could be powered by hydrogen.” Children born in 2003 are still a little ways from driving their first car, but it’s more likely it will be an electric car than a hydrogen one. Even so, during the Bush era, huge amounts of money were shifted out of researching renewable energy and energy efficiency to focus on the Freedom Car (see a sketch of the Freedom Car here). Trump has repeatedly talked about “clean coal,” although it’s not always clear what he means by that. In some instances, he appears to simply be talking about coal, full stop, even though when most people use the term clean coal they mean coal-fired power plants equipped with carbon capture and storage. If he wanted to direct research dollars to the latter, he could certainly do that, although at least one member of his transition team has recommended sweeping changes to the federal R&D program, including scrapping the Department of Energy offices in charge of distributing funds for such projects. Would funding coal R&D come at the expense of renewables? It’s hard to say. To date, Trump has appointed a number of people to his transition team who are strenuously anti-renewables, but it’s not clear how that might translate to policy under his administration. What impact will it have, either way? Even though the federal government doesn’t spend very much on energy research and development, it is a large piece of the overall funding pie. One estimate puts federal spending at a fifth of total energy R&D, with the private sector making up the rest. However, there are big differences between how private industry spends its R&D dollars and how the government does. As this 2010 paper from the Pacific Northwest National Lab shows, private investment has tended to gravitate toward established industries, like oil and gas, rather than less proven technologies, like renewables. That means removing or eliminating federal R&D dollars could slow the development of energy solutions that would help us avoid the worst effects of climate change. There are private initiatives that might pick up some of the slack, like Bill Gates’ Breakthrough Energy Coalition. But that initiative, like others, has struggled to get off the ground, and it may or may not be an adequate substitute for federal funding. For now, the U.S. remains the clear global leader in clean energy R&D, if we look at statistics that include carbon capture and storage. Whether a Trump administration decides to continue that investment or not, it’s unlikely that technologies like wind and solar will see much of an impact. But future technologies — whether that’s storage, wave energy or technologies that may not even be on our radar today — could suffer if federal funding dries up.